Pipe Major Donald MacLeod M.B.E. The tune Flett from Flotta has an interesting story behind it. Pipe Major Donald MacLeod, MBE, was a very prominent piper of old in the Scottish regiments. The regimental silver was on its way down to London for a big "do" and Donald and another soldier were guarding the silver on a train. While sitting on the crates containing the silver, they played their chanters to while away the time. Donald said they should write a tune to pass the time and when the tune was finished they were looking for a title. He asked the big soldier what was his name and where was he from. The rest is (as they say) history. The tune was written after Donald observed the peculiar gait of Flett. The rhythm is supposed to reflect his awkward walking style; it helps with the phrasing of the tune if you think of it like that, too. Flotta is an island off the south west of Mainland, Shetland. The name may come from the Old Norse, flatey meaning flat island, and the island's highest point is only ten meters. Until 1914, Flotta was a quiet farming community. In 1910, a population of 431 included two blacksmiths, four carpenters and three dressmakers. But everything changed with the arrival of the Royal Navy in Scapa Flow at the start of WWI. During World War I, the island was home to a naval base. The dreadnought HMS Vanguard sank nearby in 1917, reputedly the worst maritime disaster in UK waters. In WW2, the island was again used as a military base. Pipe Major Donald MacLeod (1917-1982) was born in Stornoway on the Isle of Lewis. He was one of the finest, most creative and merriest, recent, great highland Scottish bagpipers. He was also a remarkable teacher of the highland bagpipe. 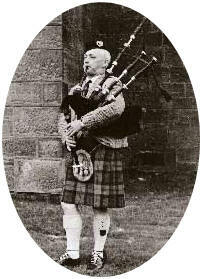 In addition, Donald MacLeod was one of the most original and innovative composers for the bagpipe. His most popular and most recorded tunes include "Susan MacLeod", "The Blackberry Bush" and "The Hammer on the Anvil". He died in Glasgow in 1982. The Donald MacLeod Memorial Competition is an invitational piping competition held on the Isle of Lewis in Scotland. The competition, started in 1994 by the Lewis & Harris Piping Society, was instituted to honor Donald MacLeod.